There are many varieties of chrysanthemums. Plants range in height from a few inches up to 4 feet tall. Individual bloom also varies considerably. There are the small button types, pompoms, cactus flowered, singles that look like daisies, semi-doubles, spiders and more. All have that distinctive aromatic foliage exclusive to chrysanthemums. Flowers are produced in the fall and last well into the colder months when hardly anything else is blooming. Chrysanthemums can be had in every imagineable color and color combinations except blue. There are two types of chrysanthemum plants. Florist mums are mainly grown as pot plants in greenhouses and will seldom survive when transplanted to the garden. Then there are the hardy chrysanthemums suitable for garden growing. These are perennial mums that put out stolons which can be used to increase your collection. It is important when buying mums for your garden to select cultivars that are hardy in your area. 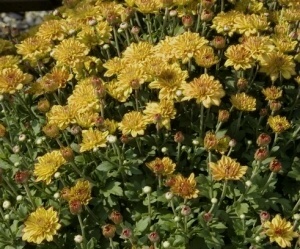 Best time to put out new chrysanthemum plants or rooted cuttings is in the spring. It can take anywhere from 75 to 150 days from planting rooted cuttings until they bloom. So it is important to start as early in the season as possible. Depending on the variety, space plants 18 to 30 inches apart in improved well drained soil in sun or partial shade and away from any artificial light source. Chrysanthemums are photoperiodic which means they need uninterrupted darkness in order to set flower buds. Three or four applications of fertilizer such as 6-6-6 should be given during the growing season. Periodically pinch or lightly prune your chrysanthemums during this time for bushier plants and many more flowers. Stop pinching mums by the end of June to allow new growth to mature in time to produce flowers before cold weather sets in. Propagation is possible by division, cuttings or seed sown in early spring. Divide established plants in spring by digging up and carefully pulling the clumps apart when new shoots are just beginning to appear. Use the younger healthy parts and throw away the old dead and woody stuff. You can take 4 to 6 inch cuttings of chrysanthemums either in fall after the bloom has faded, or in spring from new shoots. In either case, use a rooting hormone and plant in seedling mix or sand. Needless to say, fall cuttings must be started indoors or in a cold frame until weather permits hardening off and planting. Inspect plants often for signs of insects. Spider mites and aphids are especially fond of chrysanthemums.